What would cause welch plugs to blow out continually on a rebuilt engine? im battling an infuriating problem at the moment with a rebuilt b30 that will not stop blowing new welch plugs. Combustion getting into the cooling system. Blown 5 out all on the same side under the exhaust manifold. If it was combustion gases wouldn't a hose blow first? maybe get some english plugs? Could also be the type of sealant if any is used, I've always used paint, throw the plugs in the freezer for 1/2 hr, use circlip pliers to grip the inside of the plug so you don't warm them up, apply daggy old paint or whatever you use, run a ring around the sealing area, allow it to skin up, for a couple of mins and then tap them in. Also, please tell me your using mild steel units or at worse brass plugs and not the " the best stainless plugs"
I think maybe the incorrect plugs may be used. They are 35mm not imperial. They need to be tight and to flare them out. They need to be a flat/dome plug not a dish plug. I have spares the correct size. That is one theory. Otherwise they are not being installed correctly. Mistake we made on dome type was not to hit them hard enough to take the dome to flat. Learned this the hard way with 3 to get it right. 1 causing an engine loss due to overheating. We also used a two pack epoxy on advice from a Jaguar engine rebuilder as that's what they use. Sorry to hear that. (Hope you'll be there to collect your sway bars though). Use of genuine welsh plugs from Mother Volvo herself is highly recommended. Plus - US experience has shown the blocks squirm at high RPM, which will pop the plugs. The big six has a lower rev limit than the four potters. Plug retainers are recommended, e.g. the screw and washer method by John V., as shown by an example of some other gadget here. See the washers overhanging the freeze plugs? Probably easier to drill and tap some little holes than all the other genius stuff folks here are suggesting. That's different on a b230 being a cup not a dish plug to the b20/30 block. The motor is being bedded in and not revved out to my understanding too. The retainers are too extreme for this purpose. is it possible that corrosion could have expanded the slots where the plugs sit? going to put these retaining plates in. anyone got any suggestions for a source of these. otherwise these will be tacked in place. The engine builder I used always put a smear of this on Volvo Welch plugs block rim when installing to stop this problem. I think that the blocks corrode a bit in this location. He said he never had a customer come back in 20 years after he started this. On performance engines he also used a high quality clear epoxy arround the rim after installation, but not five minutes aryldite. My cars and several other 164s he built, including Vince harmers race engines, have been used in anger for many years without leaking. Might be worth a try. Not that expensive, try blackwood's or another engineering company. It is very different stuff to supercheap epoxy. Many years ago when I was an apprentice we used Stag Jointing paste, a thick maroon substance to seal Welch plugs and hit them in the middle with a ball pain hammer to make to expand and stay in position. We had same issue and used either stag or epoxy. Old Jag owners swear by epoxy. We found the biggest issue was being too soft on them. Need to get that sweet spot between concave and convex and we found we were not getting “flat” enough for want of a better description. Stag has been used on every part/ seal on this engine by the builder . 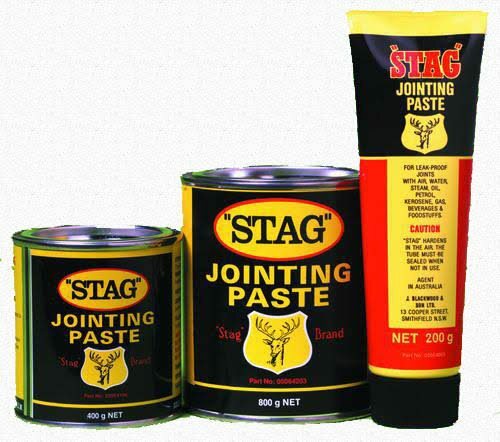 I was also taught to use stag in my apprenticeship days. The product Stag has been around for longer than I can remember (and these days it is not that long) and to my knowledge the the formula has not changed so it must work. It is primarily used for water and steam jointing by plumbers and boiler attendants and does not cost a fortune.